Most people have heard of Migaloo, the rare white humpback whale, that has been sighted off the coast of Australia since 1991. This whale was the only documented white humpback whale in the world, until 2011 when another 100% white humpback calf was born, and there have been other 'albino' whale species observed across the oceans. Many people the world over are fascinated by these gentle giants and are willing to travel great distances and fork out for the opportunity to see the majestic creatures up close and in their natural habitat. However, there is something even more special about these unique white animals that generates so much attention. 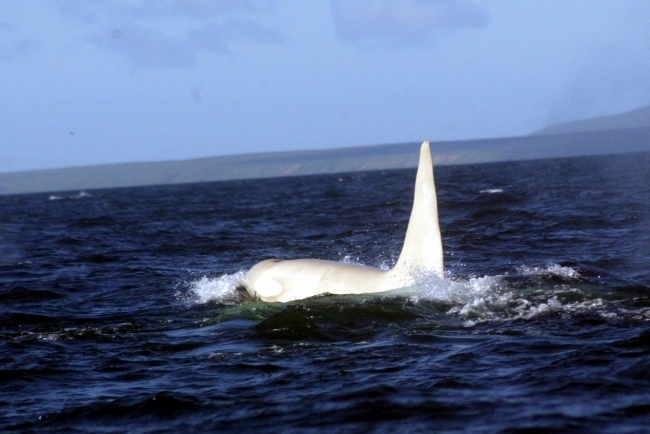 In 2012 the first albino orca (killer whale) was sighted off the coast of Russia. Iceberg, as he has been named, is thought to be about 16 years old and travels in a pod of roughly 13 orcas. I think the fascination lies in the fact that some of these white creatures are only just being spotted, despite being on this planet for some years, and just shows us how much more there is to be discovered in our mysterious oceans. Two white orca calves had been seen previously, however, this is the first adult to be spotted with this rare skin condition. Here in Algoa Bay we have also been very lucky in having some really incredible and unique sightings. 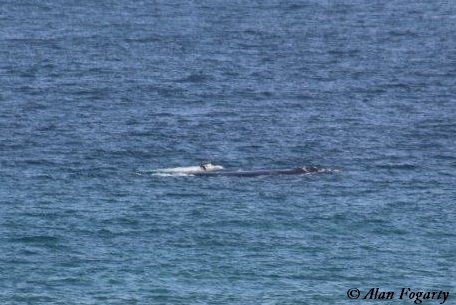 With three white Southern right whale calves having been spotted in the bay over the past 12 years. About 3% of all Southern right calves are born white, and most of these are males. This white colouration seen in the calves is not complete albinism as some darker patches are found, so the best description would be hypopigmentation (the loss of skin colour), but among us marine folk it is called 'brindled'. 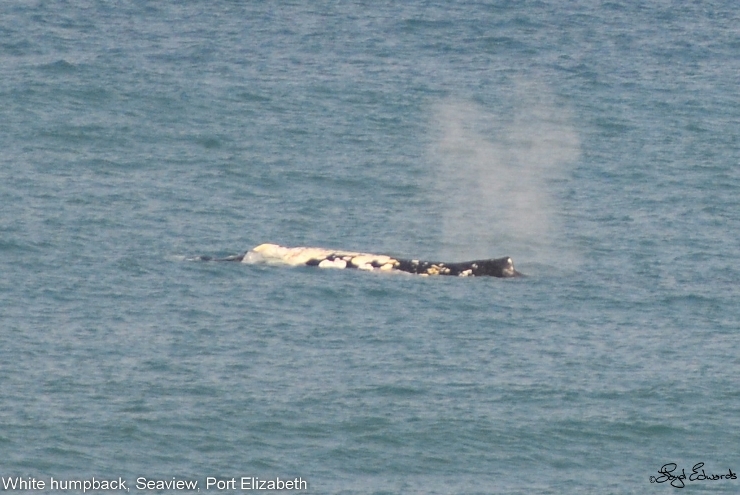 As these 'white' calves age there skin will turn a greyish colour but will never fully darken the way other it does with other Southern right whales. We have now spotted two 'brindled' adult Southern right whales over the years. 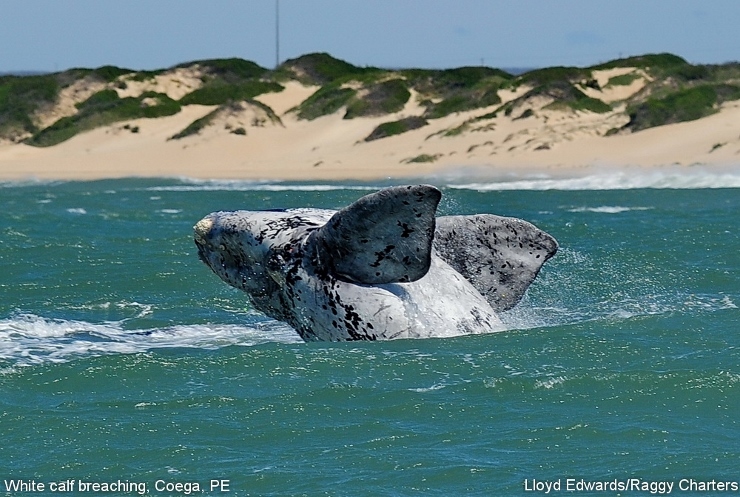 However, over the first weekend of August 2014 a white humpback whale and a white Southern right whale were spotted off the coast of Port Elizabeth. The adult humpback whale which was spotted on Saturday 2nd August, by Lloyd Edwards of Raggy Charters, has almost the same 'brindled' colouration as the Southern right whales we have seen. 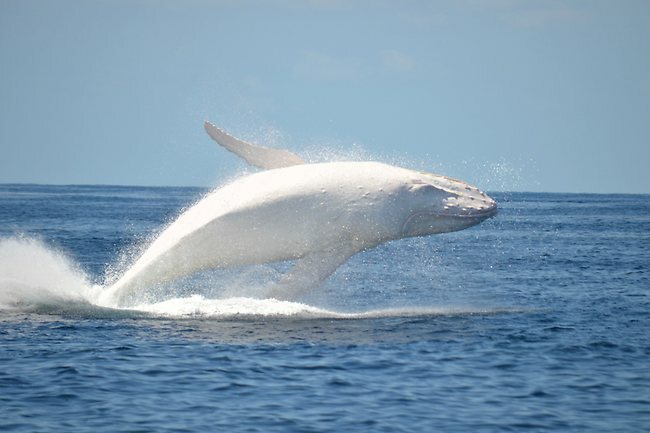 It is not completely white like Migaloo but definitely has a great proportion of white colouration on its back. This humpback whale will be heading back past Port Elizabeth later on in the year so we will be keeping a look out for him and hopefully will see more of him to see how much the white extends. 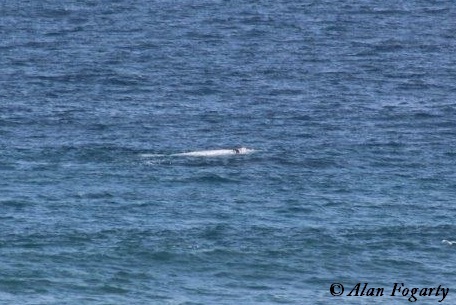 The Southern right calf was spotted with its mother on Sunday 3rd August, by Alan Fogarty of Alan Tours. Both whales were spotted in Seaview, as Alan and Lloyd are neighbours and have been working together for years offering guests of Port Elizabeth the Big 7, with Raggy Charters providing guests the opportunity to spot whales, dolphins, seals, sharks, African penguins, and other seabirds. Alan is a Level 3 FGASA tour guide and specialises in Addo outings, as his terrestrial knowledge is outstanding, having 30 years of experience in the bush. The wildlife to be viewed both on land and at sea within Port Elizabeth is astonishing; seeing a white humpback whale and a white Southern right whale within two days of each other can surely happen nowhere else. We are optimistic that the calf and mother will be making their way into Algoa Bay, where we will hopefully get the chance to see him a little closer up and they might possibly stay for some time. 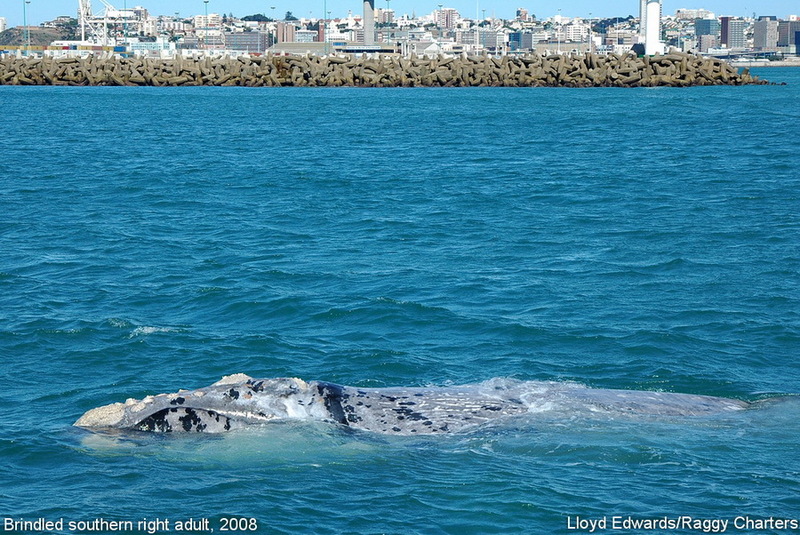 The Southern right calf which was spotted in 2012 stayed in the bay for nearly three weeks! 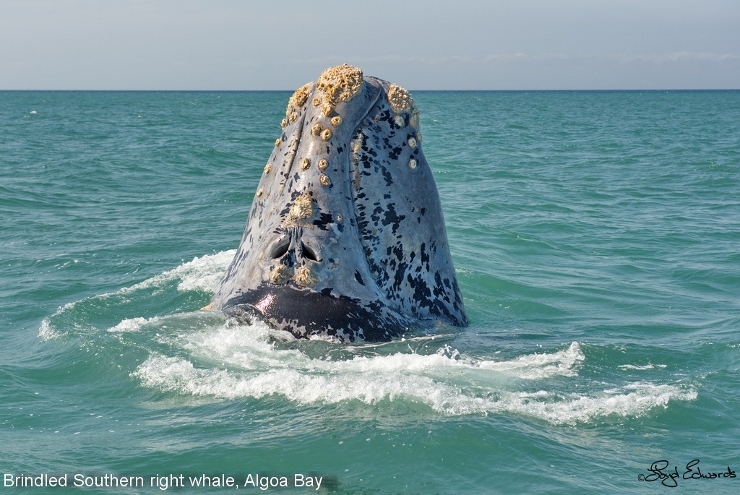 These amazing sightings are just further proof of Algoa Bay's incredible marine life and biodiversity, and supports the proposed Algoa Bay Hope Spot which is set to launch in December 2014. If anybody ever doubted Port Elizabeth for being an amazing wildlife viewing destination you have certainly been proven wrong! Ellie Bottomley, Port Elizabeth, Monday 4th August 2014.